Yep, here can Yoki learn. Just had an enquiry if my litter was â€œhome rearedâ€ or in a â€œkennelâ€ â€“ short & sweet conversation as they are in an insulated, double glazed, purpose built room with a covered run! I wonder what state seven twelve week old puppies would make in a house? 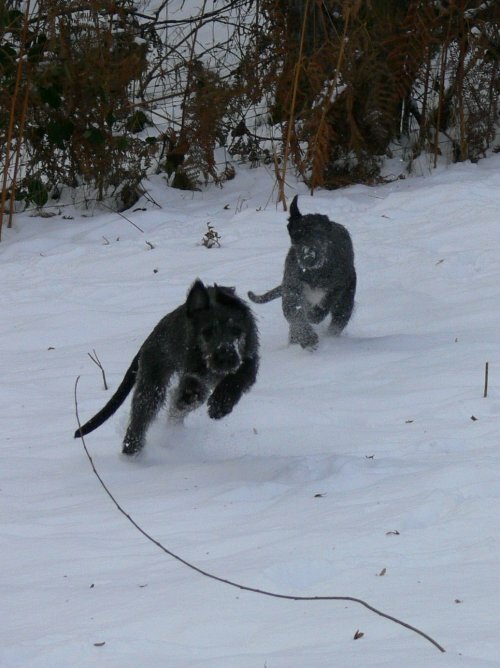 Our puppies are of the same age and they very much enjoy life outside! Just remind yourself of all the love she is going to give her new servants and that will cheer you up! Poor old John all his babies all grown up. Never mind I am sure you will see them growing up. Did you only keep the one ? At least you know you have done your litter proud. Now Wiggy Wigster I think you can do better than that! You are being very brave Wigster. This is the hardest part. Not fun at all. Mind, Willow's new Mom looks quite pleasant. I'm absolutely over the moon that one of the lovely Lodhainn pups has gone (far) north. Congratulations, Ian, and we all look forward to seeing photos of Bramble and her new big brother Blue, and to hopefully meeting her and you guys again in the summer.